Roasted Chana Dal Chikki, also known as Daliya Chikki is quite easy to make as it requires just 3 ingredients. This Crispy brittle is mostly prepared during winter, especially during the Makar Sankranti festival in India. It can be made using Sugar, but I’ve used Jaggery. Trust me; any Chikki made with Jaggery tasted better and is healthy compared to Chikki made with sugar. 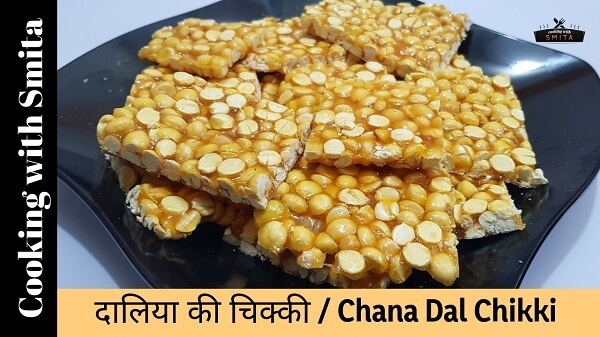 During this Uttarayan Festival, try this easy Roasted Chana Dal Chikki Recipe at home. Heat Clarified Butter in a large pan over medium flame. Add Jaggery, stir continuously and cook until it melts. Finally, add Roasted Chana Dal, mix well. To set the chikki, grease a plate with clarified butter. 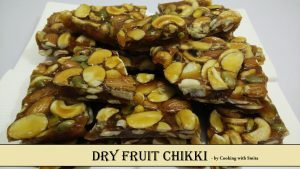 Transfer the hot chikki mixture into a greased plate. Press firmly and spread evenly using a spatula. Let it cool down to room temperature and then cut into desired size pieces. Roasted Chana Dal Chikki is ready to serve. Store in airtight container and consume within 3 weeks.